Sylvester “Sarge” Lusby had no idea where Vietnam was when he was drafted into the Army in 1965 at the age of 18. Now, it’s a place he can never forget. But it’s only recently that the 71-year-old veteran has felt comfortable enough to trust others with his story. Here are some memories he shared with his Samaritan hospice nurse and social worker. Sarge had recently graduated high school. Being called to serve his country scared him, and devastated his family. The landscape and climate of this unknown land was unforgiving. The dense brush of the Vietnamese jungle hid treacherous booby traps. The constant heat, humidity and torrential rains brutalized his platoon. Sarge, a machine gunner in the 4th Infantry Division, 1st Battalion, 8th Infantry of the Army, was stationed in the heart of the action. Sufficient water, clean clothing, and the dignity of personal hygiene were ‘casualties of war’ — and a hot meal was a rarity. Get Answers to Common Hospice and Palliative Care Questions Now. When the rains came for weeks on end, Sarge and his buddies wore uniforms that couldn’t dry out. They were afraid to change their soaked-through socks for fear their skin might peel off too. And then there was the constant hyper-anxiety you carried with you constantly like your weapon! It was a war of guerrilla ambush — fighting an unseen enemy armed with machine guns, grenades, mortars, and the land mines that were their calling card. The enemy resided above and below — in the trees and in a system of intricate tunnels running underground. You let your guard down for even a moment, remembers Sarge, and that lapse of vigilance could get you and your company hit. The shy, soft-spoken veteran shared a 1967 interview with reporter Martin Gershen of the Newark Star-Ledger to recount the bravery in action that earned Sarge a Silver Star Medal. Gershen reported it was March 22, 1967 and the day had started like any other with a regular assignment to search and destroy. However, the action that ensued just about wiped out Sarge’s company: twenty-one soldiers were killed; forty-three were wounded. At the height of the battle, with the company mortared and overrun, the company commander selflessly called in American artillery on his own position, sacrificing his life as a result. The platoon leader lay wounded, and a sniper in a tree had Sarge, a specialist E4 at the time, in his sight. The sniper had already killed three Americans and wounded four near him. Sarge kept his head down, but quickly realized he needed to act or die. Manning a M60 machine gun, Sarge and a fellow soldier fired a torrent of bullets. The sniper’s body fell between them. Ignoring the mortars and small-arms fire around him, Sarge leaped from his secure position and began dragging American wounded and dead to cover. He then took command of his leaderless platoon, organized its defenses, and restored some order to the chaos. For his actions that day, he was promoted to sergeant and awarded the Silver Star — the military’s third-highest decoration for gallantry in action against the enemy. The best day of Sarge’s Vietnam tour was the day he left 5 months later. But returning home after a year in combat would have life-altering consequences. Sarge admits to being scared coming home to a place he missed so much. He camouflaged his time spent serving his country. He never spoke of his experiences, what he saw, or even about earning the Silver Star, for fear it would be too hard to understand for those who hadn’t lived it. Despite his silence, a day didn’t go by that he didn’t wrestle with the memories forged in that distant war-torn land. Fifty-two years later, the shades are drawn except for one bright window shining light into the living room of Sarge’s Camden City home. At 71, he’s not as quick on his feet as he used to be, and speaks in a polite, low whisper that was once a boisterous bellow. Life’s had its share of ups and downs since that young, scared kid survived the jungles of Vietnam but not its aftermath. Bouts of depression and an inability to sleep torment Sarge. Severe arthritis ravages his body, especially his neck. Congestive heart failure keeps him fatigued and short of breath. 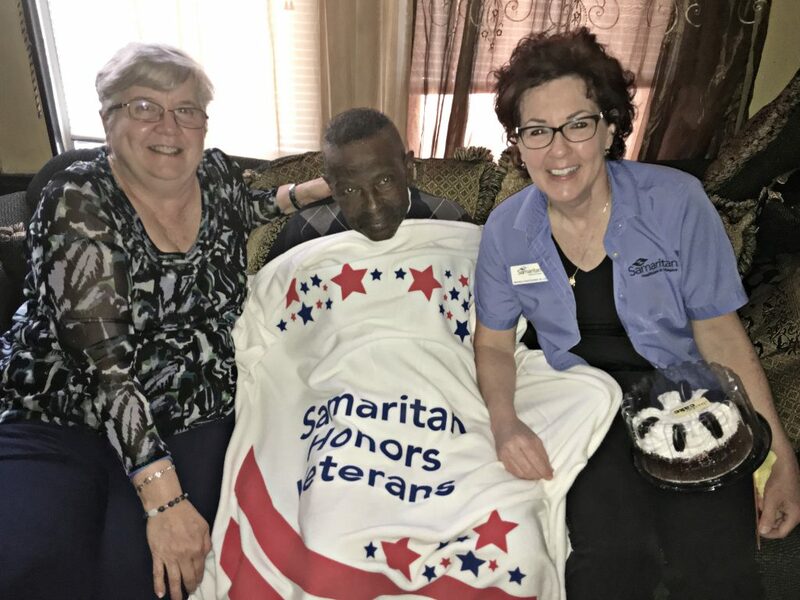 In the months following, he says Samaritan has “been good for me in so many ways.” He receives weekly visits from hospice nurse Veronica “Ronnie” Montgomery and social worker Susan Cedrone. They and their hospice team address Sarge’s physical pain and symptoms, and his post-traumatic stress, through medications, supplies, and constructive conversation. Ronnie and Susan are “my rocks, my right arm,” whispers Sarge. Before Samaritan started helping Sarge, he would make a painstaking bus trip to the VA in Philadelphia for his care. The six-block walk from the bus stop was not an easy hike for a soldier with arthritis and a failing heart. With hospice care in place, Sarge’s medications are delivered to his home, and Ronnie and Susan work directly with his VA healthcare provider to coordinate any additional needs. They’ve also honored Sarge for his service and sacrifice with a special Samaritan recognition pin and a “Samaritan Honor Veterans” blanket made possible through the generosity of community donors. Sarge looks forward to his Tuesday visits when he shares laughs and stories with Ronnie and Susan. He appreciates the “camaraderie” they’ve developed. Now, more than ever, the words he spoke to a reporter in 1967 ring true. Gershen wrote, he has “learned to be grateful for the little things – like just being alive and seeing the sun shine and being able to step out of the jungle.” Today, Sarge might add that he’s also grateful for his two new battle buddies – a nurse and a social worker from Samaritan hospice who create a safe haven and a long-awaited welcome home from the war.